For those that don't know Micellar Water is basically a collection of teeny tiny molecules of oil suspended water. 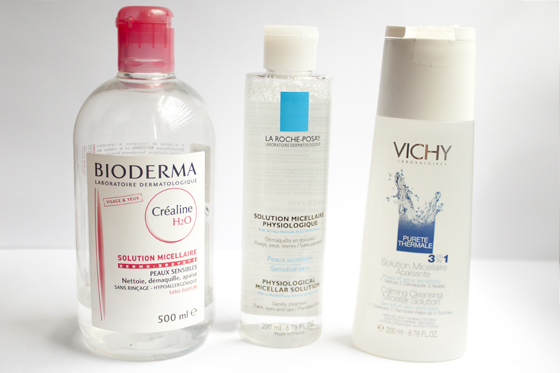 Micellar waters are alcohol and soap free, and can be used as gentle makeup removers, toners or as a non-rinse cleanser. I personally like to use them to cleanse my face before I wash it. They are brilliant at getting makeup off without having to tug or scrub at your face. I find they remove even waterproof mascara and things like lip stains with minimal effort and waiting time! I can't rave about them enough, since discovering them I can't imagine going back to oil based eye makeup removers or face wipes! First up is the most talked about Micellar water in the blogging industry, Bioderma . While it isn't all that hard to get online, It isn't actually sold in and of the high street stores within the UK. As the first one I tried it's the one I compare most other water cleansers I've tried to. It's very gentle and removes makeup with a few swipes on a saturated cotton pad. The next two are both available in Boots or a local Chemist. There has recently there has been a huge influx of French Skincare in the UK beauty market, with alot of the well known French skincare brands now available in high street and department stores.la roche posay solution micellaire physiologique is perfect for make-up removal especially on the sensitive skin on the face, eyes and lips. It removes makeup with minimal effort and leaves my skin fresh and clean. Vichy Purete Themale 3-1 Micellar Lotion does the exactly the same job, removing every single trace of makeup from my face without leaving behind any kind of residue and all without drying the skin out.